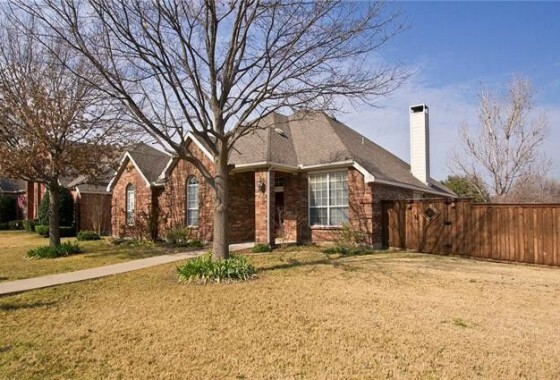 If you are looking for a Plano Texas VA home loan you have come to the right place. We lend all over Texas and several other states. Do you want special rates reserved for our country’s heroes? As a direct lender we cut out the middleman and provide our veterans with exceptional service and competitive rates. Service First Mortgage is proud to serve our veterans and active-duty families of the United States Armed Forces in Plano Texas and provide excellent rates with our Plano Texas VA Home Loan Programs. Beware of lenders that try to imply that they are affiliated with the Department of Veterans Affairs. The VA does NOT make home loans, only approved lenders do. Not all approved lenders are the same. Even those that say they specialize in VA home loans may take longer to close than The Richard Woodward Mortgage Team of Service First Mortgage. We love and support our veterans. 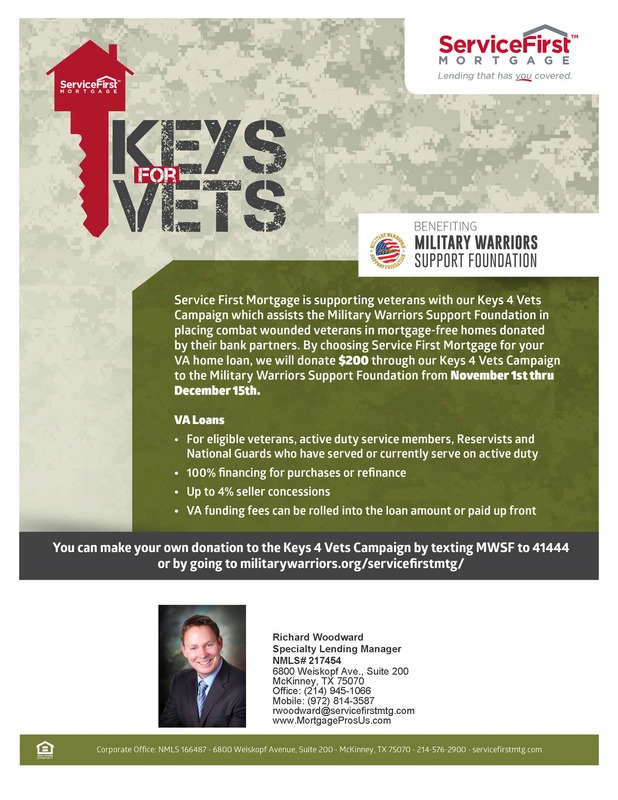 Service First Mortgage is supporting veterans with our Keys 4 Vets Campaign. My team and I are very experienced and knowledgeable in all matters of Plano Texas VA home loans. You will not have to go through an endless phone tree or be transferred to someone in a cubical in another state, you speak directly to our team every time you call. Veterans can apply for a Plano Texas VA home loan with any mortgage lender that participates in the VA home loan program. A Certificate of Eligibility from the VA must be presented to the lender to qualify for the loan. We will assist in collecting that document from the VA for you. VA guaranteed loans are made by lenders and guaranteed by the U.S. Department of Veteran Affairs (VA) eligible veterans for the purchase of a home. The guaranty means the lender is protected against loss if you fail to repay the VA home loan. In most cases, no down payment is required on a Plano Texas VA guaranteed loan and the borrower usually receives a lower interest rate than is ordinarily available with other loans. • Closing costs are often lower than other financing types. •	No private mortgage insurance requirement. •	Mortgage can be taken over (or “assumed”) by the buyer when a home is sold. •	Counseling and assistance available to veteran borrowers having financial difficulty or facing default on their loan. Although mortgage insurance is not required, the VA charges a funding fee to issue a guarantee to a lender against borrower default on a mortgage. The fee may be paid in cash by the buyer or seller, or it may be financed in the loan amount. This fee is waived if the veteran is disabled, review your DD214 to make sure of our fee requirements. A Plano Texas VA home loan can be used to buy a home, build a home and even improve a home with energy-saving features such as solar or heating/cooling systems, water heaters, insulation, weather-stripping/ caulking, storm windows/doors or other energy efficient improvements approved by the lender and VA.
For your free VA home loan pre-qualification, call us now at (214) 945-1066 or Apply Now.